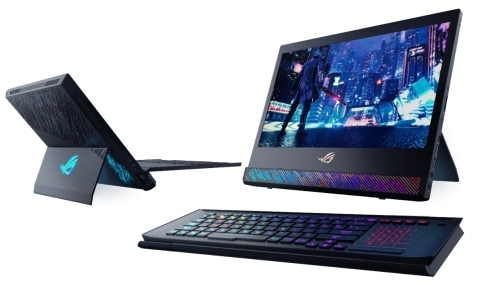 At CES 2019, ASUS revealed a new desktop replacement gaming laptop called the ROG Mothership (GZ700). The ROG Mothership has an advanced cooling system and it has a keyboard that detaches and folds for different scenarios. In terms of the screen, the ROG Mothership GZ700 has a 17.3” Full HD IPS-level display with a 144Hz refresh rate and 3ms GTG response time display featuring NVIDIA G-SYNC technology powered by the new NVIDIA GeForce RTX 2080 GPU and Intel Core i9-8950HK processor. The graphics are handled by the GeForce RTX 2080 GPU and 8GB of dedicated GDDR6 memory. With the NVIDIA Turing GPU architecture and the RTX platform, it brings together artificial intelligence, real-time ray tracing, and programmable shading. With these hardware resources, games are able to have improved lighting quality, shadows, and other lifelike effects. With a better cooling system, the ROG Mothership is able to push the CPU and GPU beyond the stock speeds and sustain high performance even under demanding workloads. The factory overclocked core is complemented with a RAID 0 array with three NVMe SSDs. Plus it has next-generation networking that enables greater than gigabit speeds for wired and wireless connections. The Intel Core i9-8950HK CPU runs at up to 4.3GHz while all six cores and 12 threads are engaged. And in Turbo mode, it runs up to 4.8GHz. The CPU is paired with up to 64GB of DDR4 memory and it is linked directly to an industry-leading NVMe RAID 0 array. The ROG Mothership idea came together when ASUS’ designers and engineers came together for brainstorming sessions nearly three years ago. At the meeting, they decided it was clear that high-performance laptops struggled with airflow because they drew from a narrow game between the base and a desk. So the ASUS team came up with an idea where key components could be placed behind the display in order to drive greater airflow from the back. The components behind the screen keeps the keyboard cool even after hours of continuous gaming. And there is a special shield that prevents heat from the CPU and GPU from affecting the display. And from tests conducted on the system, the core temperatures were much cooler with a standing orientation. Based on research, ASUS also learned that gamers often use desktop replacement laptops with an external keyboard and display so the laptop occupies a lot of desktop space thus causing issues with achieving a comfortable position. Plus ASUS determined in its research that gamers prefer keyboards off to the side and at an angle, which is not possible with traditional laptop layouts. As the GZ700 was being put together, a number of prototypes were created that introduced a detachable keyboard and a folding design that reduced the systems’ footprint. The design of the Asus Mothership GZ700 features a hinged stepless kickstand that pops out automatically from the bottom edge of the chassis after it touches a surface. This allows for one-handed deployment. And the hinge allows the user to adjust the screen the screen for different setups from a range of angles between standing forward and leaning back. The main body of the ASUS ROG Mothership GZ700 was created with solid slabs of aluminum in the form of a protective metal jacket that can survive bumps and knocks. And the chips are covered with a network of eight heatpipes that transfers thermal energy to the heatsinks at the edges. And these pipes are linked to the heatsinks at the CPU, GPU, graphics memory, and VRM. There are a number of modes for controlling the fan speed. The turbo mode uses the highest frequencies and fan speeds to reach maximum performance. Balanced mode optimizes performance and cooling to drop noise levels while gaming. And Silent mode reduces acoustics for lighter workloads and less demanding games. Plus you can set custom profiles that can be created with tweaked fan speeds and frequencies that can be adjusted to the user’s preference. In terms of audio, it is anchored by a premium ESS Sabre DAC and headphone amp with Hi-Res Audio certification up to 24 bits and 192kHz. And the output has a greater range, less distortion, and a more accurate frequency response than alternatives. Plus the Sonic Studio III software adds surround sound virtualization for headphones and other devices such as VR headsets and external USB DACs. The built-in webcam supports 1080p30 footage and Windows Hello facial recognition. Next to the webcam is a microphone input, which is able to filter out background noise. The ROG Mothership has a Realtek 2.5G Ethernet controller that more than doubles the speed of typical wired ports. And it is paired with next-generation Intel Wi-Fi 6 AX200 (802.11ax) technology that pushes peak interface bandwidth up to 2.4Gbps in ideal conditions. Plus it has patented ROG RangeBoost technology that augments the Wi-Fi by constantly scanning the user’s surroundings and shifting between two pairs of antennas to maximize signal strength. These antennas are arranged to cover each other’s dead spots in order to extend range and improve reception. The ROG Mothership can connect up to three displays via HDMI 2.0, Thunderbolt 3, and Type-C USB ports. The Type-C USB port supports VirtualLink for next-gen VR headsets. When will it be available? The ASUS ROG Mothership will be available in Q2 2019. And pricing and configurations are going to be announced at launch.